Steinbrecher Fellow Maggie Tarbox ’19 put her title of student-athlete to work as an intern for Project Limestone in Nassau, Bahamas. Project Limestone is a nonprofit organization dedicated to helping children pursue their athletic and academic passions. In her internship, Tarbox coordinated closely with Project Limestone’s founders, Antoan Richardson, a former outfielder for the New York Yankees, and Crachad Laing, serving as a liaison to other area service organizations and helping with administrative tasks. She also wrote curricula for the organization’s after-school and summer camp programming. 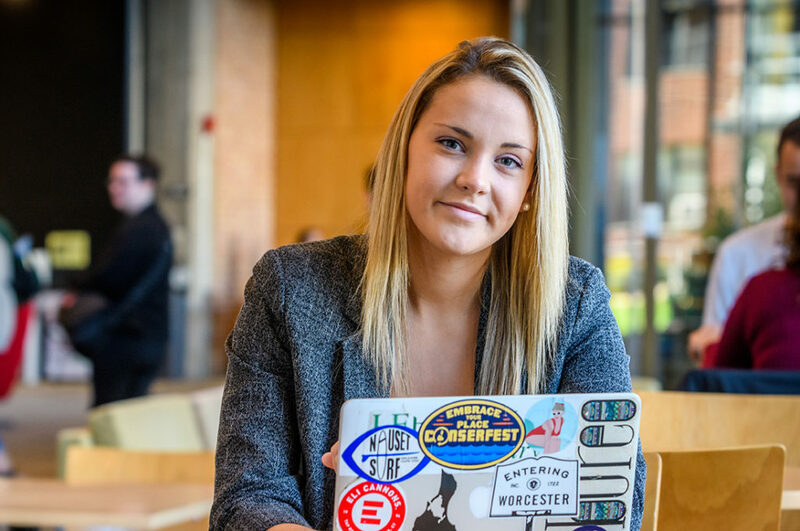 At Clark, Tarbox is captain of the women’s tennis team and spent three years as student assistant to the women’s basketball team, joining the team as a player this year. We asked Tarbox, a history major and education minor from Lebanon, Connecticut, about her experience at Project Limestone and at Clark. What did you do at Project Limestone? I was able to experience many aspects of the organization’s mission, outreach, and impact during my stay. In addition to writing curriculum, I attended meetings regarding upcoming Project Limestone programming, including presentations to potential funders. One presentation to the local Rotary Club led to the funding of Project Limestone’s STEM Saturdays, which began this fall. 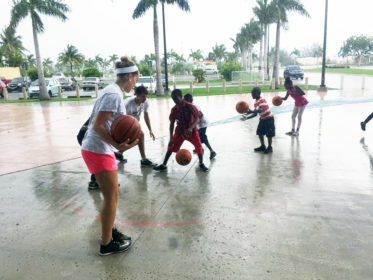 Maggie Tarbox plays basketball with children as part of Project Limestone in the Bahamas. One of my assignments was to research age-appropriate benchmarks and character development goals for Limestone’s educational and baseball skill development programs. Using that research, I created a framework for the curriculum that will serve as the foundation of Project Limestone’s everyday practices. I was also involved in the rebranding process for the organization, working closely with the founders to articulate clearer mission and vision statements, as well as specific project charters for each program Project Limestone will offer. What additional community service work did you complete during your internship? Through a religious youth group, I helped facilitate outdoor team-building games, including basketball and other activities. At STEMiverse, a local STEM camp, I assisted students with their daily projects, while also observing the camp’s curriculum and methods, to evaluate future applications for Project Limestone. I collaborated with Hands for Hunger, a well-established non-profit in Nassau dedicated to food rescue. I collected surplus food from restaurants and hotel kitchens and delivered it to soup kitchens and churches in needy communities. I was also able to help coach and organize team-building activities for a Bahamian youth baseball travel team at a West Palm Beach, Florida, tournament. How has your time at Clark prepared you for experiences outside of the classroom? Clark has encouraged and supported my desire to reach beyond my comfort zone. With classes designed to challenge students to see multiple perspectives, and professors who encourage their students to test their perceived capabilities, Clark’s culture fosters a safe learning environment marked by support and collaboration rather than competition. The endless opportunities to work hands on in the community, along with Clark’s philosophy of serving, have prepared me well for future experiences and enabled me to envision and confirm my vocation. The lessons and encouragement I have received at Clark have given me confidence to persevere despite setbacks, build relationships through the learning process, and have a positive impact on others. Can you describe a memorable learning moment at Clark? During my tryout for the women’s basketball team in the fall of my first year, I was rushed to the hospital for what ended up being major emergency surgery. I was embarrassed, and even worse, I was disappointed that I would be unable to play on the team. Then I got a phone call from Coach Pat Glispin, whom I had only known for two months. She called to check on me, thanked me for trying out, and told me she still wanted me to be a part of the program. She created a student assistant position that would enable me to continue to be involved with the team. Coach Glispin knew that by giving me an opportunity to serve in this capacity, I would still be a valued member of the team, and could still contribute, in a different way. She taught me that even difficult circumstances can create new and positive possibilities, and that my value wasn’t based on my ability as a player, but as a person. Her continued support allowed me to join the basketball team as a player for my final year at Clark. After graduation, I hope to enter graduate school to pursue a master’s degree in school counseling and eventually work with students as a high school guidance counselor. My time at Clark has equipped me with a strong support network, confidence, and passion. Clark has encouraged me to be a creative and flexible thinker, and to demonstrate leadership in serving others.